"I can remember numerous times in numerous interviews where every member of the band has been quoted as saying that it was our favorite place to play," drummer Stanton Moore says about Tipitina's. "It is our musical home away from home, so it's been in the back of our minds for maybe 20 years where it's been a pipe dream." After two years of talking with the owners and seven months of negotiation, Galactic finally made that pipe dream come true. All the while, a 10th album was in the works, including a track titled "Touch, Get Cut" featuring New Orleans neo-soul singer Erica Falls. Saxophonist Ben Ellman explains that the title 'Touch, Get Cut" is what Falls would always write on her leftover food that she would leave on the bus "to make sure that nobody would eat it." "It just felt like an appropriate title for a song featuring her," Moore says. "And to use her words, she is intentionally referencing the Me Too movement ... so it had a whimsical beginning, but much more serious lyrical content." "Now that we have Tipitina's, people ask me 'What goes through your mind?' I say 'Well, play every gig like you own the place.'" Moore says. "But you know, you don't want to be cocky. You just want to play with confidence and joy." Already Ready Already is out now via Tchoup-zilla Records. 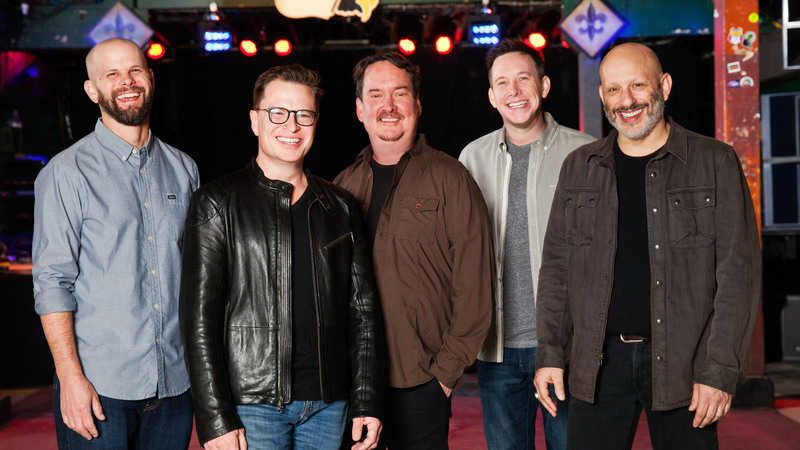 Band members Ellman and Moore spoke with NPR's Scott Simon about Tipitina's, concepts behind Galactic's latest album more. Hear their conversation at the audio link.